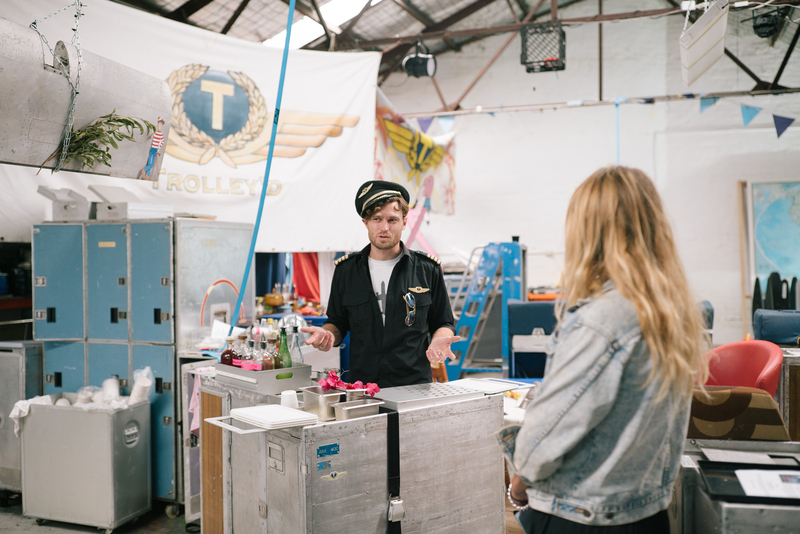 Sure, two grown men donning old pilots uniforms and pushing re-imagined airline trolleys around parties as they serve up fancy cocktails is novel, entertaining even, but that’s not the reason I wanted to meet the guys from Trolley’d. As the old saying goes “people don’t buy what you do, they buy why you do it” and Trolley’d really seems to have their ‘why’ down pat. 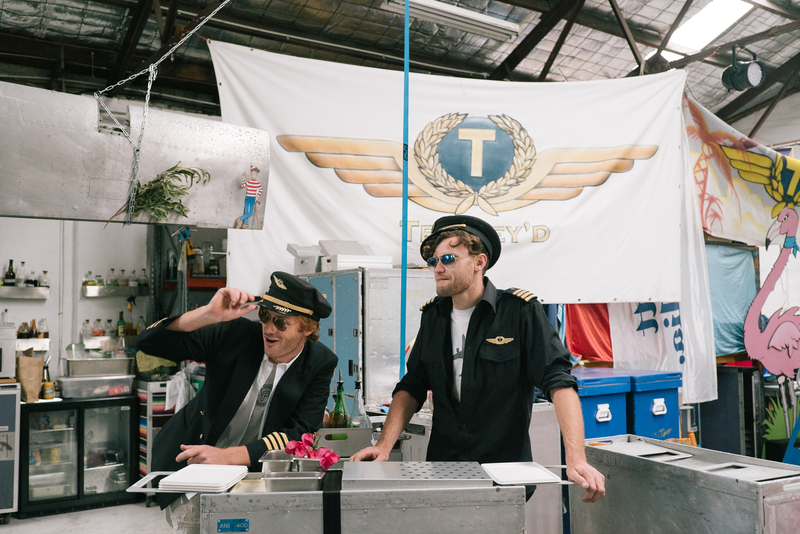 A portable bar hire business run by Christopher Thomas and Byron Woolfrey, it’s Sydney’s first bar embracing the qualities of sustainability, native Australian, foraged and local organic produce. While I could spend the next couple of paragraphs drawing ‘inflight’ connotations and probably throwing a couple of airplane puns around, I’m more interested in drawing parallels between their business ethos and the future of sustainable food and drink in Australia. 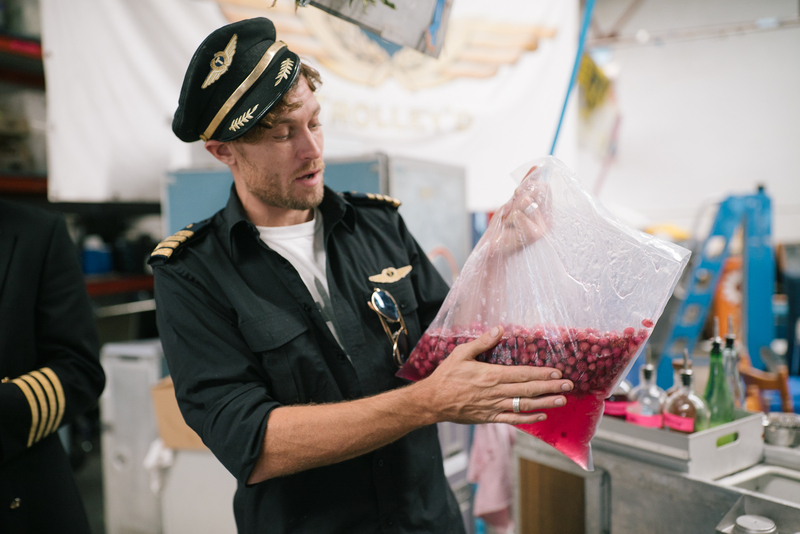 I catch up with them at the Trolley’d HQ in Sydney’s inner west, a haphazard warehouse filled with Ansett Airlines memorabilia, a poker table, and a consortium of natural elixirs. Self proclaimed hospitality aficionados, Chris and Byron first worked together at well known Bronte cafe, Three Blue Ducks, which they would eventually use as a platform to launch Trolley’d. Here they connected on their shared ethos around sustainability and local organic produce. “When we started we were working at Three Blue Ducks together. They helped us out a lot and let us use their van to cater at events, they were really great. We actually first set up an organic lemonade stand at Bondi market, then moved into lemon myrtle, and it just evolved into this whole other thing. We realised that there was this abundance of food around us that’s edible and great for you and we can use it all to make delicious tasting drinks,” said Chris. A few years prior, Chris had sunk some money into an Ansett Airlines auction, and basically collated the largest collection of Ansett memorabilia in the world. A little kooky sure, but that investment including a fleet of portable bars would later become the foundation of a great events concept. There are few city dwellers that can claim they literally get their food from the land, but the boys from Trolley’d can count themselves among the few foragers that call Sydney home. Often found scouring bushes, up trees and picking ‘weeds’ around the inner west, the two young dads and business partners are all about “using what’s in season, learning more about Australian flavours and understanding how to incorporate the local ingredients found all around us into what we eat and drink,” says Byron. Chris explained how it’s not hard to identify food you can forage once you become a bit more informed about it. “There’s stuff that’s evolved and been around Australia for thousands of years. The big supermarket chains try to take you away from going out and picking your own food, but even our kids will go around and pick lily pillies to eat now”. When I ask them what separates Trolley’d from other events companies, I expect them to say something about the thematics or even their artful spirits. Chris laments that it’s all about giving back. Exploring their blog and cocktail recipes you’ll often come across Kombucha recipes, as well as ingredients like Bergamot, Quandong, Mulberry Leaf and other things I’m not sure I’m pronouncing right. 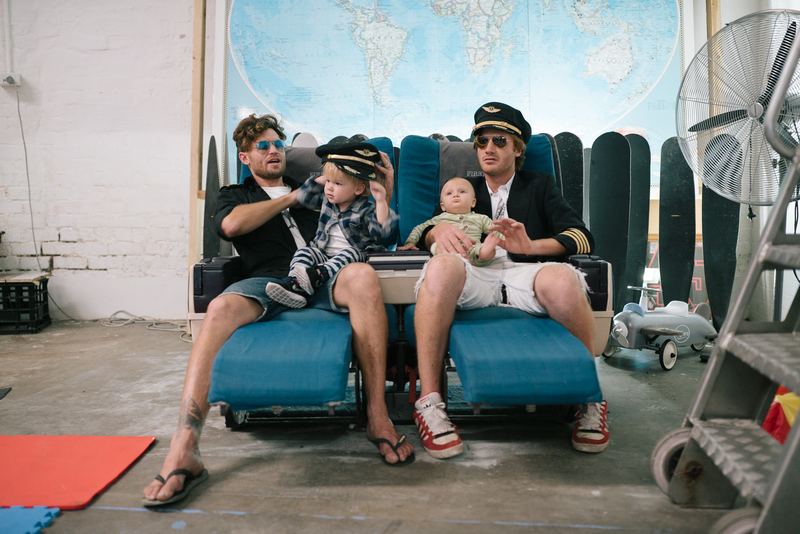 With their roots so deeply sunk in the land around them, the boys have now moved from not just using and educating people on local ingredients, but now also getting people involved and interacting with their Kombucha Batching. This is where their newly created socialist wing, Culture Clubbing, comes into play. 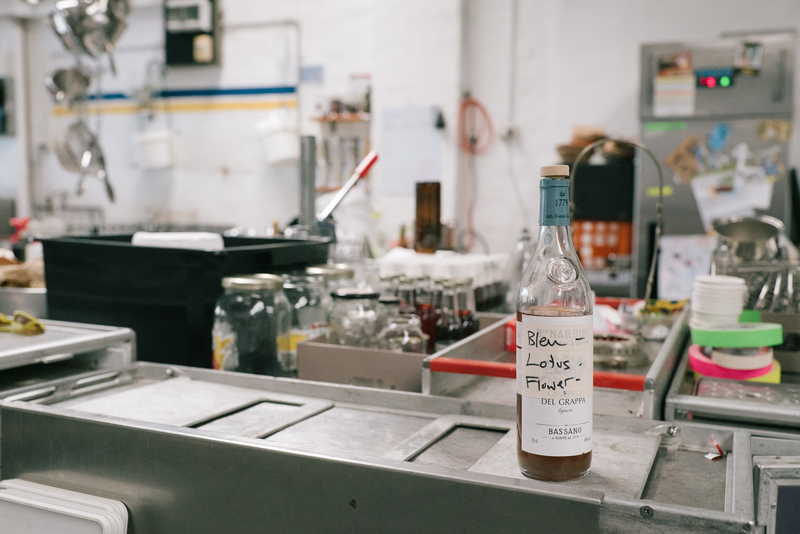 “Our Kombucha batching, Butch Batches, happens of a Saturday morning for anyone who might be keen to come by, lend a hand and take some Kombucha home with them. We’ve also got heaps of native seeds that we’ve been guerrilla planting, so if anybody wants to swing by and grab some at any stage they’re always there,” said Byron. For these two guys, foraging isn’t just a fad, it’s a way of life and not in the weird culturally blasé way either. Their ‘why’ runs through everything they do and it is unfaltering. Even their kids are involved in foraging things like lilly pillies and dandelions. And now and into the future, their momentum is all about making everything they use, moving away from sugar and producing their own products, which seems like a pretty bright future considering it’s a growing mentality across the board. “From cocktail syrups to liqueurs, eventually that’s the direction we’ll go into, cocktails at home and any other complimentary products. Not only will it open up a whole new world for us, but hopefully it will open up a whole new world for everyone else too”. 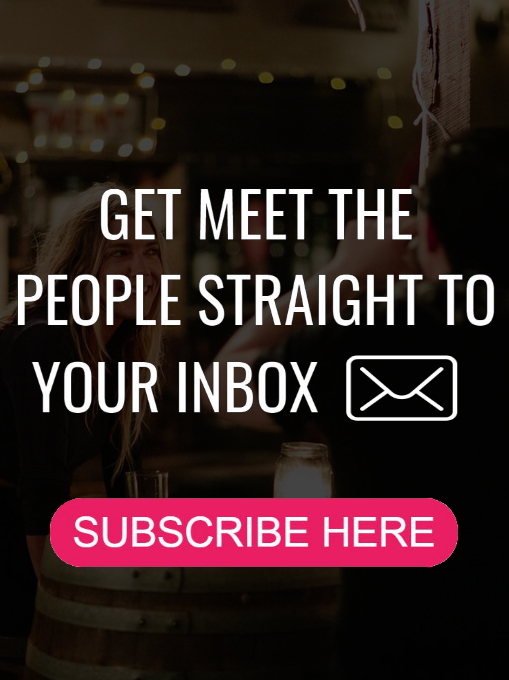 Are you someone we should meet, or know someone that is? Follow Meet The People on Facebook and Instagram.